Based on environment-friendly principles, we produce a variety of oils and handcrafted Rooibos and honey infused vinegar, the real South African balsamico. 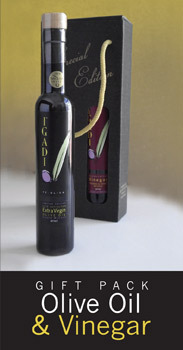 IGADI™ Ye-Oliva limited edition (delicate) dark bottle made from the olives grown halfway up the mountain, whose oil boasts an elevated content of polyphenols but that is soft on the palate with a delicate bouquet, ideal for exquisite preparations of high quality food. No preservatives or coloring are used in our oils or handcrafted vinegar. Pure full fruit taste from Mother Earth. The Extra Virgin Olive Oil – first pressing – comes from olive trees that have been neither treated with fertilizers nor insecticides of synthesis. The deep dark bottle will prevent oxidation due to exposure to light. To prevent oxidation caused by contact with air that would be trapped after bottling, we work with inert gases. We cork our oil, like a wine. This beautiful wooden cork is filled with a synthetic stopper so that the oil cannot be affected. Once the oil is bottled, it is possible that dark sediment sinks to the bottom. There is no filtering, which is a sign of the IGADI™ quality. Oxidation and deterioration begin as soon as the cork is removed and the air comes into contact with the oil. Never use large bottles (eg.1 liter) that stay in use for months (would you do that with a wine?). The oil will lose its rich aromas and healing properties. Use small bottles which you finish quickly, we’ve taken care of the rest (quality). presented in a gift box - charcoal box with golden handles, ideal for special occasions. 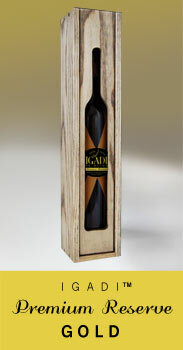 Dark glass bottle, presented in wooden box with ribbon. 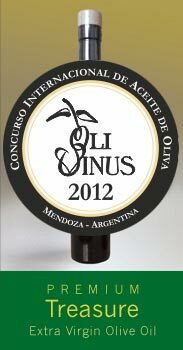 This precious oil is pressed from a variety of premium olives. It is a milder oil and its taste is slightly grassy with a banana and light peppery aftertaste. Use it on smoked salmon, soups, ice-cream, for marinating fish or meat.